Although often thought of as a small country, Scotland has a vast array of different sights and sounds to experience. From the historical to the cultural, traditional to modern, natural to man-made, each place offers something completely different. Do you only have a few days to spend in Scotland? Do you want to see as much as you can of the country’s stunning scenery? Where do you start your visit? Simple: the Isle of Arran. Situated off the west coast of the Scottish mainland in the Firth of Clyde, Arran occupies just under 170 square miles of land, but dubbed ‘Scotland in miniature’, it offers a true taste of Scotland’s best bits, particularly when it comes to breathtaking scenery. And what’s fantastic is in even the shortest of overnight stays to the island, you can experience a substantial amount. Start on the east coast at Brodick. This part of the island is the only part that has a constant connection to the mainland. (While Lochranza also has a connection, it’s only accessible in the summer months.) Head south along the coast towards Whiting Bay. This is a lovely walk itself. But when you get midway between the two villages, stop in Lamlash. It offers two fantastic points to take in: the stunning backdrop of the Isle of Arran behind you and a wonderful view of Holy Isle just off the coast. This is a tiny 2×0.5mile island upon which a modern day Buddhist community resides. Heading down along the south coast and up to Blackwaterfoot on the west, the beautiful Kintyre greets you. This is not just Paul McCartney’s residence for several years, but the inspiration behind his popular 1977 hit “Mull of Kintyre”. Slightly inland from Blackwaterfoot, you can play 12-hole golf with spectacular views of the entire island. Your handicap may end up increasing as your eyes wander! Moving north, you could stop by Machrie Moor and observe the prehistoric stone circles before heading towards Lochranza on the north-west coast, a favourite for animal enthusiasts as you’re regularly able to see red deer, grey seals and golden eagles within the surrounding area. Make sure you arrive at Lochranza early. There are many reports that suggest because of the village’s location, it doesn’t receive a great deal of sunlight. In fact, it receives least of any village in the UK! Finish your journey by moving back along the east coast, past the village of Corrie and arriving at your starting point of Brodick. Here, you’ll be ready to start your walk all over again the following day after a relaxing stay in the tranquil surroundings. As a whole, Scotland really does have something for everyone. No matter where you visit, you’ll be able to sit back and take in what many believe to be the most stunning scenery in the world. 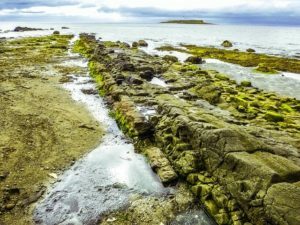 The Isle of Arran is easily accessible and boasts an array of things to see and do. 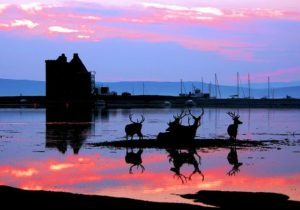 It provides the perfect opportunity to get a real taste of picture perfect Scotland in one location.